The Double Bubble windshield gives the rider an aerodynamic advantage. This windshield is designed with a bump or bubble allowing even the tallest of riders to tuck in tight so the air flows over the windshield, the helmet and the rider. 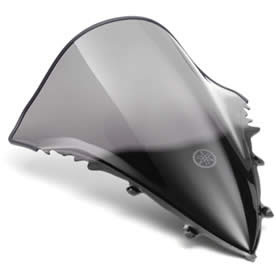 The factory R1 windscreen comes in a standard clear colour. The tint or smoke colour is a popular option with other colours also available depending on the year of your bike. This replacement accessory is a precision fit for the R1 as they are genuine Yamaha parts. All come with the genuine silk print Yamaha tuning fork logo on the inside of the windshield.